Sports: Whether you're looking to reduce your recovery times or improve your performance, these socks are going to give you and your calves a big boost. Useful for walking, jogging, running, marathons, hiking, skiing, cycling, football, rugby, tennis, basketball, netball, triathlons, cross fit, weight lifting, athletics, etc. Work: If you have a job that requires lots of standing or walking then these socks will definitely help you out by reducing fatigue. Great pharmacists / nurse compression socks. Flights: Don't forget to take your compression socks on holiday with you - whether you have long or short journey - they're great in helping blood circulation thus preventing deep vein thrombosis (DVT) and blood clots. Pregnancy: Fed up of tired, swollen feet / legs? Looking to avoid varicose veins? Add these pressure stockings to your maternity life and you'll be much happier. 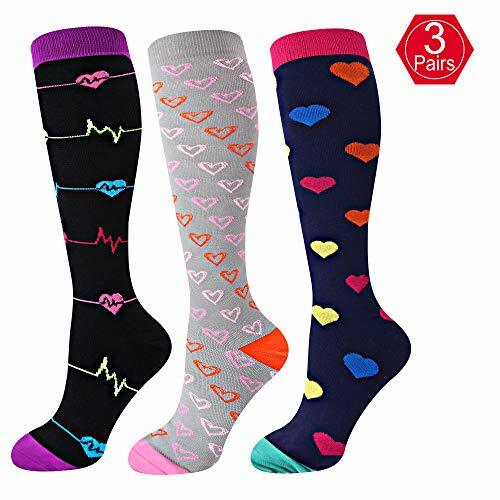 ✔15-20 mmhg compression socks - Scientifically allocated compression strength from heel to calf.We use same compression technology from our Sport compression socks, which will gives ideal compression to boost your blood circulation and oxygen flow. ✔Doctor's advice - EHbee womens & mens compression socks are recommended by doctors and preferred by trainers, It is a LONG term solution to solve your problem if you have lymphedema, DVT, splint shin, varicose veins and diabetic. It would also brings extra comfort to your leg! Especially when you stand all day therefore feeling fatigue or swelling. ✔Great Gift Option - Still struggling with Present selection? Bring a pair of these cute & patterned compression socks to your family or friend. ✔100% Money Back - Please refer to the size chart as shown in the images section to select the suitable size. If the size you choose does not match, please contact us. We will send you new replacement or full refund. If you have any questions about this product by EHbee, contact us by completing and submitting the form below. If you are looking for a specif part number, please include it with your message.